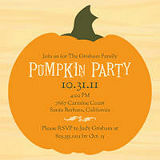 The best place to start with your Halloween baby shower ideas are the invitations. 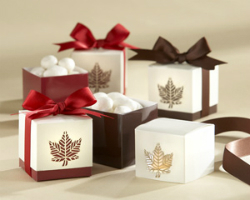 The very cutest- and surprisingly affordable seasonal party favors around. 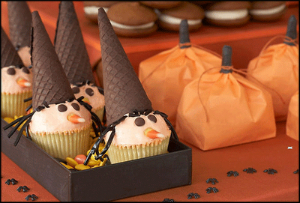 If you decide to do a Baby Halloween Shower, you will have a wealth of options for decorating, party favors, invitations, shower games, diaper cakes, baby shower gifts, and so much more. 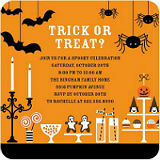 Retailers and vendors offer a lot of choices for the themed Halloween party. You won’t come up short on anything you need buy. 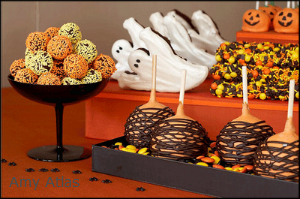 TIP: Even though it’s Halloween, nothing too graphic or gory. It’s important that your guests to still feel like they are at a baby shower. Nature and your own back yard, lend well to this theme too. The obvious are pumpkins, of course. 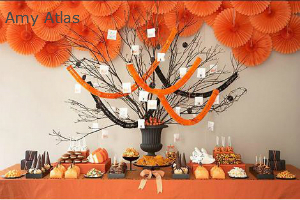 Twigs, branches, colorful leafs acorns, and harvest goodies will help make your party festive. Celebration Express is a partner site we love because of their inventory, fast delivery and awesome service. They are like a great big party headquarters online. It’s a great place to shop for this, that and the other. They always have cool stuff for the holiday’s, and that includes Halloween costumes for babies, toddlers, kids, and adults. 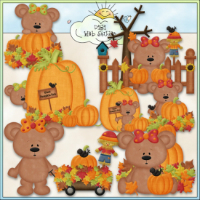 If you are looking for a great deal on fall, Halloween, or other baby images, this is my favorite affiliates. There are over 4000 images and they’re all $1.00 or less! Go to:Digi Web Studio – Original Clipart For Immediate Download! 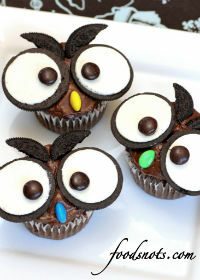 Owl cup cakes made with split Oreo cookies and m&m candies. Too cute! anything you think of, will fit well with a Halloween theme. For a couples or coed shower, have the men come in full maternity wear, stuffed with pillows, while the women are dressed as doctors and nurses. 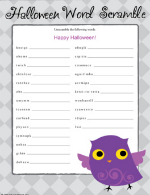 Have a blast with a printable baby shower game. Customize it right online and then print it from your home computer. It’s a great way to add a personal touch to your event. Your guests will be impressed and you won’t spend a small fortune for entertainment. 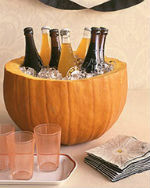 Little Pumpkin: This fits great with, Halloween Baby Shower Ideas. Again there is so much you can do with this theme. We love this idea that we found on creativecuts.com. Use two small pumpkins, draw a cute baby face on each one. Paint the faces with colors that compliment your palette. Once paint is dry, carve a small hole for a month, and insert pacifier. Way to cute and easy! as well. Cookie cutters in the shape of your theme are also a great option. other wrapped candy’s work well. 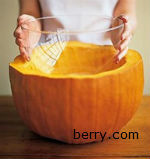 Carve simple designs into pumpkins. Circles, Stars, or even little Diapers. Of course, a tea light or small candle will add the finishing touch. The following is a list of wholesale options for anyone who wants to do some crafting, make their own baby shower favors, or just save some moolah! 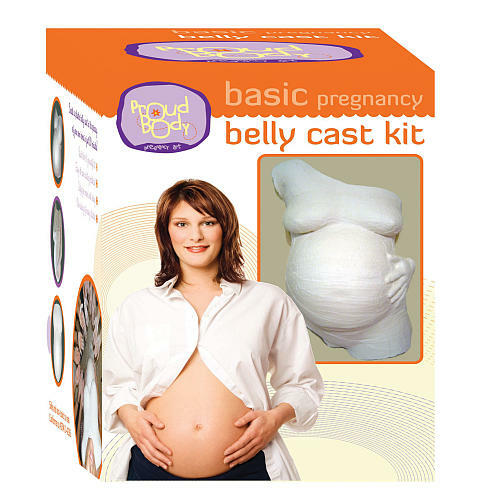 www.buyinbulkshirtwarehouse.com if you are plan to paint baby shirts or bibs, and you need a lot of them. They have a lot of clothing for the hole family too-all name brands. Retail me not has lots of coupons and daily deals. Last week there was a post for 75% off baby shower favors, but the posts come and go. Alwaysunderpay.com is a great site for baby girl tutu, crafts, ribbon, and all things girly. WE have a Google search bar located at the bottom of this paragraph. You can copy and paste the sites, if you care to visit any of them. Be sure to mark this page if you want to return. 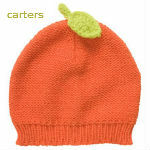 Carter’s is a staple for great baby gifts. 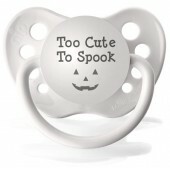 They have really cute seasonal clothing and accessories- including adorable baby costumes. We’ve been dressing our girls in Carter’s for years. Everything they make is durable and comfy. I recommend shopping the Carter’s website for the best deals and selection! 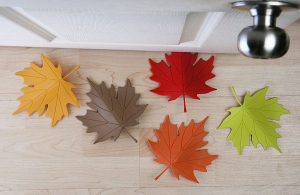 Here’s a cute idea for a door stopper from, Qualy. There are many more ideas in their site. Very cute and very unique! These stoppers would make a great party favor, or even a great “baby-safety” gift. String little lights in purple or white. Hang little ghosts, or spiders from tree branches; add pom poms on alternating branches. Stack pumpkins from large to small. Use stencils to spray paint BABY GIRL or BABY BOY on pumpkins. TIP: Cut your Halloween shapes from blue, pink, or pastel poster board. Use dried corn, milkweed, cattails and boa feathers, colored tinsel, or garland to form a wreath for your front door. Cut six foot strips of crepe paper and hang them from the ceiling and chandeliers. Again, pom-poms and paper ceiling lanterns are a great way to decorate any room. Purchase two dozen white carnations. Trim stems at an angle while they are under cool water. Fill glass jars or containers with water and several drops of food coloring. Place flowers in colored water over night. The stems will pull the color into the flowers. Now you have custom-died carnations to match the colors in your theme! TIP: Follow the chart printed on your box of food coloring to achieve the proper shade. Some color ideas: Purple, Orange, Black, or Red. TIP: Make your flowers go further. Use Scotch Tape to make a full grid over the top of wide glass containers. (This is an example of what it looks like before it’s completed) Place stems through openings. This will give you a beautiful & full arrangement, and you will you fewer flowers to achieve the look. 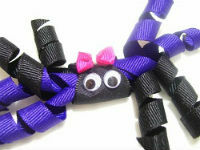 This little spider makes the perfect party favor for any Halloween Baby Shower. Your table will look very festive when these little spiders are used as napkin rings. Place a little magnet on the back and you have a cute party favor for your guests to take home and hang on their refrigerator. They do take a bit of time to make, but they are not hard to do! 7/8 inch Fabric ribbon (grosgrain is best) in your choice of color. Measure and cut 20 inches of 7/8 inch grosgrain ribbon. Heat seal the ends of the ribbon to prevent fraying. Heat sealing can be done with a lighter or other small flame. If you are not sure how to do it, use the search box on this page to get instructions. 1. Wet ribbon with water, squeeze out excess. Wrap damp ribbon around the length of wooden dowel. 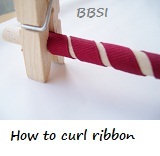 If you want a tight curl, be sure the ribbon touches- for a loose curl, use small spacing between ribbon. (see picture below). A tight curl is recommended for the spider project. 2. Secure both ribbon ends with wooden clothes pins or other clamp that is heat resistant (again NO plastic). Set on baking sheet and continue to wrap the rest of the wooden dowels. 4. After 25-30 minutes, remove ribbon from oven and allow it to cool and dry. 5. Gently slip the ribbon off the dowel. Find the center and cut ribbon in half. Do this for each piece. 6. The spider is made with eight legs ( 4 on each side). Find the center (again) on a piece of ribbon you just cut. Pierce the center with a needle and thread. Stack 3 more pieces on top of the first and repeat the process of running a needle and thread through. Create 3 or 4 loose stitches, them tie the stitch off. 7. The center stitch should be loose enough to fan the legs out and give your spider a little shape. Heat seal the ends of each leg. 8. To make the body of the spider, use 1/2 wide satin ribbon Measure 4 inches of length, cut and heat seal the ends to prevent fraying. Use a bead of hot glue to anchor one end of the satin ribbon into the center of the legs. Loosely wrap the ribbon around it self until you have formed a small circle or ring, secure loose end with hot glue. 9. Secure a magnet on the back side of the spider with hot glue. Use glue dots or doubled sided tape (do not use permanent adhesives) to add a ribbon that will be used to tie around the napkin. Guests should be able to remove the ribbon to access the magnet underneath. 10. Use hot glue to add eyes, bow, or any other embellishment desired. Wrap ribbon closely with no gaps for tight curls. Use gaps for loose curls.